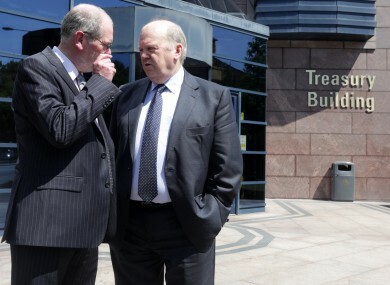 Minister for Finance Michael Noonan and NTMA CEO John Corrigan at the NTMA's Annual Report for 2012 launch today. THE CEO OF the National Treasury Management Agency (NTMA), which oversees Ireland’s national debt, said earlier today that Ireland is “fully funded” for next year and we are in a “comfortable position going into 2014″. Speaking at the launch of the NTMA’s Annual Report for 2012, John Corrigan said “we are on target” to exit the bailout programme but was cautious and added that “Ireland still has a long way to go”. The Minister for Finance was positive about Ireland’s economic situation and congratulated the NTMA for its success on re-entering the bond markets and reducing Ireland’s debt by €20 billion. However, the minister added if he had to describe Ireland in one word it would have been “debt”. He said we are “spending more than we raise in taxes and that can’t continue… We have to make sure that the State can fund itself on the markets”. In the seventh auction and the second last of 2013, Ireland sold another batch of €500 million three month government bonds at an annual rate of 0.20 per cent. Noonan reminisced about days when “bond auctions wouldn’t get a mention in the paper” and “I’d like to get back to that. Like it’s normal for Ireland to be raising money”. “I’m confident that our debt position has become more sustainable,” said the minister. The Finance Minister would not give anything away about what would be included in next year’s budget, which will be published on Tuesday, 15 October. He said the Troika would be getting an “outline” of it but they would not be included in forming it. Email “How would the Minister for Finance describe Ireland in one word? Debt.”. Feedback on “How would the Minister for Finance describe Ireland in one word? Debt.”.